Click for more photos from Zones! 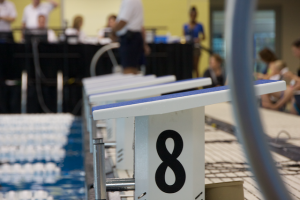 The Colonies Zone 2013 Long Course Championship were held in Richmond, VA, on June 22-23. There were 152 swimmers representing 32 clubs and 12 LMSCs. This was the first sanctioned USMS meet at the GRAP Collegiate School Aquatics Center, which houses the pool used for the 2008 US Olympic Trials. The pool fulfilled its promise, as a whopping 95 new Zone Championship records were set! These included two new world records, one by Leslie Livingston in the 50 backstroke (clipping 0.02 sec off her own record in the 50-54 age group) and one by the Virginia Masters Swim Team 400 free relay of Marcia Barry, Johnnie Detrick, Laura Walker and Shirley Loftus-Charley. The VMST relay walloped the previous record, knocking more than 21 seconds off the previous mark. There were also four new national records: the previous two swims, plus another by Livingston in the 50 fly and Erika Braun in the 50 back. Shirley Loftus-Charley after setting one of her seven new zone records. We have photos! Want to share yours? We have a number of photos of the event on our Flickr page. Would you like to contribute some photos to share with the others? Please contact me. Complete team scores are available. Host Virginia Masters Swim Team won the large-club division (11+ entrants), while Reston Masters won medium-club (6-10) and Terrapin Masters took the small-club (1-5) honors. Complete results are available in HTML format (with cumulative and subtractive splits) and PDF format (suitable for printing). All results and split requests have been uploaded into the USMS results database: one of the easiest ways to check your swims is to choose your name in the pull-down menu. Results are unofficial for the moment but should be pretty accurate; please contact me if you spot any errors. A complete listing of all new world, national and zone championship records is given in the table below. The table is searchable, just type a name or club (or any other term) in the search box to filter the display. Members of the host Virginia LMSC also set 58 new LMSC records.